The IT Crowd is easily one of the funniest comedy series on television thanks to producer Ash Atalla (The Office) and writer/director Graham Linehan (Father Ted) who give us an almost real-world snapshot into the world of IT support. Based in the fictional company of Reynholm Industries, the "IT crowd" are hidden away in the basement as they get involved in all sorts of hi-jinx. It's uncanny how realistic these IT crew actually are. 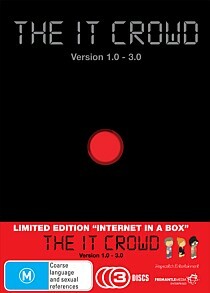 The characters of the IT Crowd include IT slacker Roy (Chris O'Dowd), the socially challenged Moss (Richard Ayoade) and computer illiterate Jen (Katherine Parkinson), their "Boss" who mimic almost every IT nerd/geek stereotype cliché from around the world. Joining the IT crowd are some wonderful supporting cast members that include Noel Fielding as the depressed and gloomy Richard and Chris Morris as Matt, their bosses in the world of Reynholm Industries. These are the stars of the IT Crowd and help turn this comedy series into a piece of comical Champaign of a high calibre. With that said, this box set contains all 18 episodes from the first three seasons. But without the brains of Graham Linehan behind this series, it would probably have fallen flat on its face. The humour of Linehan quite witty and entertaining at the same time and some of the one-liners that he gets his characters to say will put a big fat smile on your face. The majority of humour is all innuendo as opposed to slapstick and he really gets inside the characters headspace. There are some classic episodes such as Aunt Irma Visits which revolves around Jen's period (named Aunt Irma by Jen) that causes a chain reaction across the global IT support world. Or even stranger, the episode entitled Men Without Women where Douglas attempts to bed Jen by seeking out an Irish sorcerer with Roy and Moss rescuing her from the octopus. Apart from the witty storylines, the IT Crowd has some truly standout performance from all the actors involved and the relationship between them translates well to the screen and will have you in stiches through every episode. And don't get me started on the Calendar Boys episode where Roy makes a geek calendar. Uh-oh! Having seeing all this on TV before, I still thoroughly enjoyed this box set and I'll definitely be coming back to it again. It's not just quirky comedy but comedy that can be enjoyed by all!